I'd like to share a personal investment tale with you, the origins of which go back a ways. I became involved in physical precious metals/futures trading in 1972 after reading Harry Browne's book, How to Profit from the Coming Devaluation. Not unlike David Morgan (before we knew each other) I accumulated metal and silver futures contracts, and rode prices into the March 1980 top. I sold my futures, but held the metal until the Hunt Brothers were knocked out of the game after the CRIMEX changed the rules to contract-offset only, collapsing the silver price. I watched silver drop through Harry Browne's "sell if it goes below $37.50" call to $10.80. Then, during a classic 50% retracement to $25, I asked my broker where he though silver would bottom. His answer: "$5.00." He called it almost to the dollar, but it took a generation to get there. In 2000, after buying a one-ounce gold Krugerrand for my daughter's high school graduation and watching people at her party view it with zero interest, I decided to move back into the sector, focusing on physical metals and mining company shares. 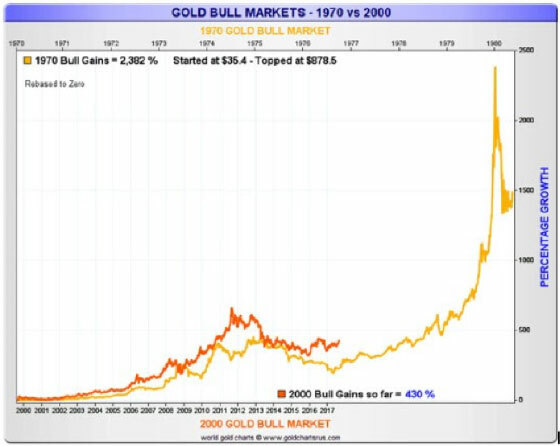 As the new bull market was getting underway in 2001, I decided to write on a piece of paper the following sentence: "On June 22, 2011, win, lose or draw, I will exit my position in the metals and mining shares." Fast forward to May, 2011. Having worked with David Morgan at The Morgan Report for a decade, we were following the resource sector on a daily basis for subscribers and for our own accounts. His brilliant call to buy silver in the mid-$20 range enabled his subscribers to re-enter for almost the entire upward surge to just under $50... and then he called that cyclical bull market top, to within one day. I called it a day later in an email to Greg McCoach. You might be asking: "What about that note you wrote to yourself, saying you 'would get out on June 22, 2011 - win, lose or draw.'?" My honest answer, unaffected by greed or ego? My 10 years' earlier sell call was predicated upon the belief that by 2011 we would have seen massive public participation into a blow-off secular top. But that simply had not taken place. Sitting through the last 5 years was financially painful, but thankfully, instead of just holding onto everything, I moved in and out of mining stocks during the ups and downs into the December, 2015 cyclical bottom, while keeping a physical metals' position. It wasn't easy, but knowing that contrarians reap the biggest gains, I re-bought the strongest mining survivors as a new rise seemed likely. $26.00 - $3.50; $10.20 - $0.26; $13.00 - $1.00; $3.20 - $0.09 cents. This demonstrates why most people who want to control risk and limit the downside during serious declines should focus on holding physical metal. In my considered opinion, when silver penetrates and builds a base above $26 on the upside and gold does so above $1,500, we can be reasonably assured that the bull run is back in full swing, with - at the very least - an eventual challenge of the 2011 highs. Once those highs are penetrated convincingly, above $50 silver and $2,000 gold, the public will enter the market in waves, seeking to buy metals and miners, plus anything remotely connected to them. (My original silver target – which still seems realistic – is an eventual [Phase III] price into the top of $175 - $250/ounce). This (correction) convinced the majority of market opinion that the bull was over. However there was a young independent observer by the name of Richard Russell who noted that the market had not yet shown characteristics of a phase III. Instead the market had been busy climbing the wall of worry and hadn’t had time to become manic yet. He therefore made a market call that one should buy the correction and hold on and wait for the phase III. His career took off from there. Richard Russell went on to become the doyen of financial newsletter writers, publishing until his passing in November, 2015. Notice what factor informed Russell's advice to "buy the correction and hold on and wait..." Because, as he stated, "the market had not yet shown characteristics of a phase III...and hadn’t had time to become manic yet." I am certainly no Richard Russell, but in mid-2011, my metals' decision was motivated by the same reasoning he had reached concerning the DOW. For the record, I will state, there will be another, more frenzied scramble that will carry silver prices to highs that will repair all the excess paper money creation, price suppression, supply deficit and bearish sentiment over the past two decades. This will become known as "The Great Silver Crisis." 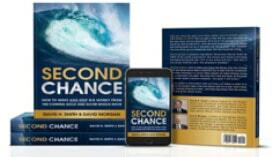 A big reason last fall that David and I wrote Second Chance: How to Make and Keep Big Money from the Coming Gold and Silver Shock-Wave was to make available to our readers, the very best thinking on this subject about why we felt the next few years would offer such asymmetric profit potential. With metals, the miners, or both – risking a reasonable amount – in order to have a shot at gains all out of proportion to the position size makes eminent sense. In it we offer a complete tutorial on how to structure your position so you can stay "in the game" as long as possible, yet still get out with a big profit chunk of your earnings. We have not yet witnessed the public mania phase of this bull run. The difference between now and the late '70s, when gold lost half its value before rising 850% in less than 3 years, is that there are now even more legitimate reasons for an extended replay of this scenario. Instead of less than 4% of the investing public then – mostly in North America, plus a few prominent Arabs, we've got just about the entire world on our side! And there is the Chindian Love Trade. Furthermore, we have an indebted global system that cannot pay back at anything close to its present value. And we're half way through the last act of The Fourth Turning, which one way or the other is destined to wring out the monumental financial excesses of the last half century. You may be dispirited watching "the cartel" continually knock down metals' prices, just when they seem ready to fly. You may be tempted to give up on the metals and join the crowd into a stock market bubble that's been rising for nine years. We understand your frustration. At first blush, you may not you agree with us. But our message to you is this - when it comes to the upside potential for the metals and miners - take some time to consider the evidence and do the math. Because... in our considered opinion, your biggest mental picture still might not be big enough!